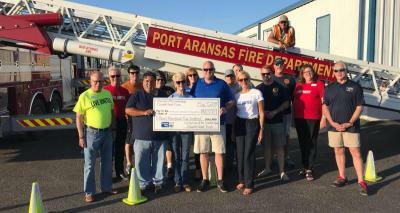 The Port Aransas Volunteer Fire Department will put the $15,500 gift toward purchasing a new brush truck and its specialized equipment. MAY 9, 2018 – The Port Aransas Volunteer Fire Department (Port Aransas VFD) sustained structural damages and loss of equipment when Hurricane Harvey made landfall last August. A major loss was a brush truck the volunteer firefighters used to combat flames on Mustang Island and all of the firefighting gear it required. The $15,500 donation from United Way of the Coastal Bend’s Disaster Relief Fund will be used to purchase a new brush truck radio, fire hose, tires, a thermal imaging camera and to cover a portion of the cost of a replacement brush truck. The Port Aransas VFD consists of 25 volunteer firefighters who serve approximately 4,000 people and 12 square miles of Mustang Island.